GHANAsoccernet.com understands Ghana Premier League side Medeama will not take part in the Ghana FA Special Competition set to kick start next weekend over untenable ‘fixture faux pas’. The two-time FA Cup holders are livid after their petition to the Normalisation Committee on February 8 to revise the fixtures was ignored. Medeama, which is the lowest lying Southern team have shockingly been maintained in the Northern zone following the latest fixtures released on Friday amid the huge protest from the club. GHANAsoccernet.com understands the club is extremely unhappy with attempts to force the unpopular decision down their throat, vowing to pull the plugs on their involvement. Per the Normalisation Committee’s own demarcation, the Mauve and Yellows appears justified in demanding for their team to be placed in the Southern zone. GHANAsoccernet.com sources say the club’s top hierarchy feel disrespected after the FA failed to even acknowledge receipt of their petition on February 8. “Medeama SC per its geographical location is based at the lowest part of southern Ghana and by proximity ought to be grouped in group B of the fixtures released yesterday. We are by this letter requesting your esteemed outfit to reconsider Medeama SC and place it at its rightful position if fairness and professionalism is any thing to go by as far as this competition is concerned as indicated in Article 11(8) of the Regulations of GFA Special Competition.” part of the letter sent to the Ghana Football Association on February 8 read. They feel there are underhand dealings to hand them a raw deal and won’t budge easily amid outrage among their teeming fans in Tarkwa. Sources say the club is not interested in any financial enticement package to change their stance and want to be housed in their required grouping. 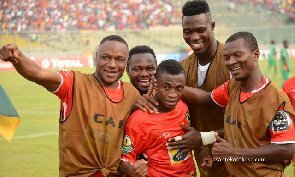 The 2014 and 2016 CAF Confederation Cup campaigners have insisted it will only participate in the competition if the “right thing is done”, GHANAsoccernet.com understands. The club’s management have the full backing of the board and club owner Moses Armah, who are not happy with attempts to twist their hands and court public disaffection for the team. Per the current decision, Medeama must travel 145.2km to Obuasi, 205.4km to Kumasi, 298.4km to Bechem, 362.3km to Techiman, 328.8km to Berekum, 309.1km to Dorma Ahenkro and 664.6km to Wa to honour matches in the Northern zone. The launch of the much-postponed competition will take place at the GFA Secretariat on Monday March 25.